Are you looking for a reliable roofer in North London? At JR Roofing we are experts in work on listed and period buildings, and as part of that specialism we have found the best suppliers available for products that are sympathetic to the character of older buildings. From soffits and fascias, cast iron guttering, and lead work – we can carry out work to renew roofing and brickwork on your build using tradition methods and materials. 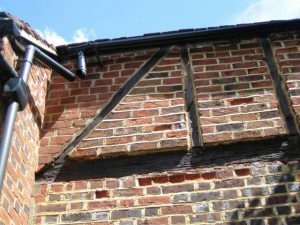 Required in some conservation areas, cast iron guttering is true to the original construction of many buildings in North London and around. The further benefits of cast iron include its durability, and it will last well for many years with the right care. We undertake work on traditional buildings such as churches, and have an excellent supplier of British lead to for this kind of project. Lead is traditionally used as a flashing to seal a joint on the roof or as a sheet covering, and JR Roofing are fully proficient on both methods. If you are working on a conservation project chances are your chimney will require some work, if not full restoration. From re-pointing to structural work, we can make sure your chimney is sound and complies with any listing requirements. At JR Roofing we are proud to have built up a list of clients that covers many sectors of the commercial and domestic world, and to have become known as contractors specialising in conservation work. Whether its roofing or brickwork you need us for, you can be sure we’ll carry out the job with the same diligence and attention to detail that all our clients enjoy. So whether you need roofers/roofing contractors in North London for a new roof installation or just repairs to an existing roof, phone JR Roofing first.